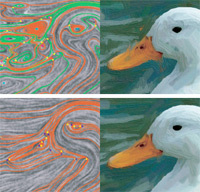 Designing tensor fields in the plane and on surfaces is a necessary task in many graphics applications, such as painterly rendering, pen-and-ink sketch of smooth surfaces, and anisotropic remeshing. In this paper, we present an interactive design system that allows a user to create a wide variety of surface tensor fields with control over the number and location of degenerate points. Our system combines basis tensor fields to make an initial tensor field that satisfies a set of userspecifications. However, such a field often contains unwanted degenerate points that cannot always be eliminated due to topological constraints of the underlying surface. To reduce the artifacts caused by these degenerate points, our system allows the user to move a degenerate point or to cancel a pair of degenerate points that have opposite tensor indices. Eugene Zhang, James Hays, Greg Turk (2007). Interactive Tensor Field Design and Visualization on Surfaces. IEEE Transactions on Visualization and Computer Graphics, 13(1), 94--107.